Published by: Imagesoft, 1990 | Developed by: Motivetime Ltd.
Dragon's Lair led to the creation of numerous video games for home systems. 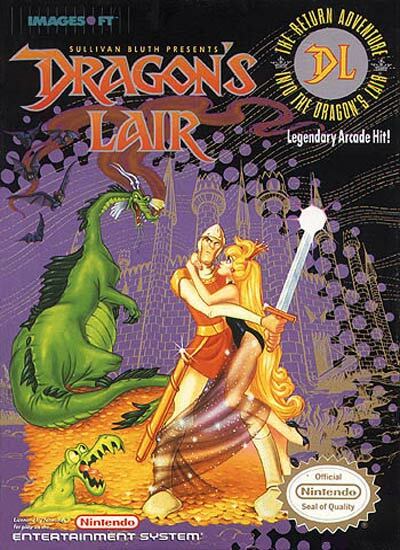 Since some original sequences did not fit in the ports for those systems, they were re-released only in a virtual sequel called Escape from Singe's Castle; A non-linear arcade interpretation of Dragon's Lair and Escape from Singe's castle with elements of platform and puzzle, was made by Software Projects for 8-bit machines in 1986. A simple platformer adaptation of the game was also made for the Nintendo Entertainment System and Super NES, although most are disliked by gamers for shoddy game construction. For instance, in the NES version Dirk is given a life bar, but most anything that touches the player will result in immediate death.